If you love video games, there's no way E3 isn't an exciting time. Whether you're a fan of shooters, racers, indie games, or obscure Japanese cooking-rhythm games, there's something there for you. There were tons of games to get excited about at this year's show, with titles like Metal Gear Solid V: The Phantom Pain and Witcher 3: The Wild Hunt putting on impressive demos, Sunset Overdrive hitting the show floor, and a few reveals like From Software's Bloodborne. But that doesn't mean E3 isn't without its disappointments. There's always a few things missing. Here are some of the things we didn't see this year that we'd hoped to catch a glimpse of. Some of these we can expect to see in 2015 as we've already had hints and explicit announcements that they're in development; a few others we're hoping desperately for the smallest clue on. We were all so sure this was coming. Rockstar had hinted that it would be announcing a new generation console game set to release in 2015, and Take Two's CEO Strauss Zelnick made it worse when he said it was "quite obvious" that Red Dead Redemption is a permanent franchise for the publisher. Then E3 actually got here and Sony unveiled the new generation edition of Grand Theft Auto V. To be entirely clear, I'm super stoked about GTA V. I loved cruising around Los Santos and I'm looking forward to checking out an even-more-authentic version. Despite that, I and many others were disappointed to have that tease waved in front of us and yanked away. The first Red Dead Redemption is still an incredible game. It's not anymore perfect than any other game, but it does so much right. It's still gorgeous, for one thing. The different areas, foliage and wildlife all feel perfect. I played this right before Watch_Dogs and found myself disappointed with how bad Watch_Dogs on PS4 looks compared to Red Dead. The game also provides an interesting, compelling main character whose history allows you to play him as you will without it feeling out of character. The gunplay is excellent, and the horseback riding still feels smooth. I think there's plenty of stuff to explore in the Old West, and I'd love to see what Rockstar can do with the setting and a new character. 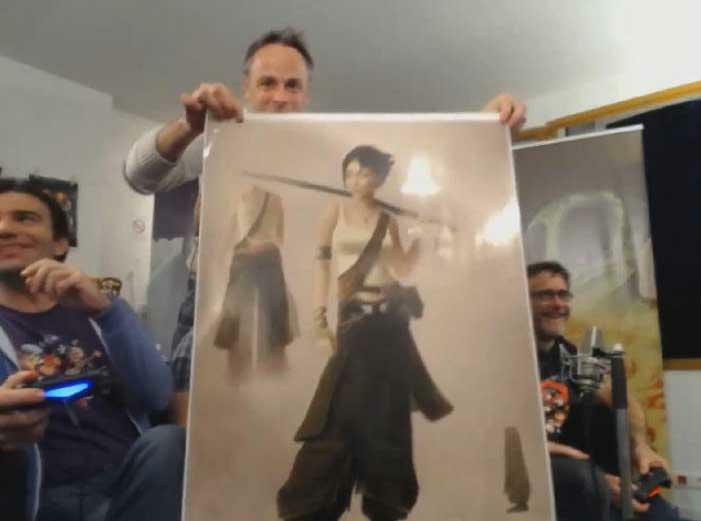 Rayman creator Michel Ancel has been sitting on the sequel to his beloved cult-hit Beyond Good & Evil for quite some time. He recently teased the game during Ubisoft Montpellier's live stream of Rayman Legends, and I thought for certain that we would be finally be seeing something this year at E3. Instead, we got a bunch of games from Ubisoft we already knew about during its mostly uneventful show. Even a teaser would have spiced things up a bit. Beyond Good & Evil 2 was first shown at Ubidays in 2008 with a CG trailer that was met with mixed reactions. Many fans loved the fact that Beyond Good & Evil's plot was going to continue, and we could finally solve the intergalactic conspiracy with Jade and Pey'j. On the other hand, it looked awfully tainted with the worst trends of the early generation. Pey'j went from being a loveable anthropomorphic pig to a brutish and scruffy beast who ate flies through his nose. Yuck! Not exactly someone I would want to hang around with. Even worse was the over abundance of dirt and "brown." The uniquely green and gorgeous world bursting with character in the first game had been lost to a boring lifeless desert. Fans generally believed that publisher interference forced Ancel's team to adapt the game into a more sellable product that went with the times. In 2008, "brown" and "gritty realism" were in, and it scarred Beyond Good & Evil 2. Since the first official reveal, all we've seen from the game was a leaked trailer of Jade free-running through a desert town, escaping from gunfire. While exciting, many believed that the camera following our heroine was a little too smart in knowing what she would do next and that it wasn't actual gameplay. Whatever it was, it was far too advanced for what video games were doing at the time. Turned out, fans were right this time. Beyond Good & Evil 2 was revealed to be too much for the previous generation consoles, and those eagerly anticipating its return would have to wait for the next console generation. Well, that is now here, but Beyond Good & Evil 2 is not. Ubisoft CEO Yves Guillemot's response? I think you will really like what you see in the future. It could take some time to make sure we are really delivering what we want. Square Enix has gone three years now without localizing its classic and beloved RPG series, Dragon Quest, and yet games continue to pile up in Japan. Many are worried that the series didn't do well enough on the Nintendo DS to justify Square Enix looking into distributing to an American audience again. In those three years, Japan has seen Dragon Quest X, Dragon Quest Monsters 2: Iru and Luca's Marvelous Mysterious Key, and the highly anticipated remake of Dragon Quest VII for the Nintendo 3DS. Oh yeah, Dragon Quest XI was also announced during E3 for a next-gen console, so no need to rush these things, right? Dragon Quest X not being localized so quickly is understandable because it is an MMORPG that had a really hard time taking off in Japan. Square Enix was in disaster management mode after a weak launch on the Wii and a weak re-launch on the Wii U nearly crushed it right out of the gate. Luckily, it finally found an audience on PC and smartphones and has been doing well ever since. In America, Square Enix is still trying to get more fans to play the fabulous MMORPG Final Fantasy XIV: A Realm Reborn. No need for Dragon Quest X to be localized right now. Dragon Quest VII though has no excuses anymore though. For starters, Square Enix dropped the ball on Bravely Default, leaving localization to Nintendo after thinking that a handheld JRPG had no audience in America. Turns out, Bravely Default became a surprise hit and sold more than Lightning Returns: Final Fantasy XIII, an HD console game heavily marketed and touted by Square Enix as the end of the Final Fantasy XIII age. Let's not make that mistake twice, hey Square Enix? Dragon Warrior VII, as it was called back on the PlayStation, was a decent RPG bogged down with stiff animations and a ridiculous amount of grinding, a holdover of NES-era RPG development with ambitious old-timers running amok with the power of CDs. Nobody except insane fans wanted to play it for 100+ hours. Them and over 4 million Japanese fans. All fingers point to the Nintendo 3DS remake streamlining all those wonderful ideas and story elements into a much tighter and more enjoyable package. Dragon Quest VII sold a million copies in its first week in Japan, and all we need now is an English translation. Square Enix has been sitting on a trademark for something called Seeds of Salvation for quite some time, a subtitle that fits perfectly with both the plot and the series' use of alliterations, but nothing has come out of it officially. I'm still sure we'll be seeing this game this year, if not next. E3 instead revealed the long awaited release of Final Fantasy Type-0 from the PSP in Japan on next-gen consoles in America, meaning Square Enix is currently playing catch up to its backlog from even before Dragon Quest VII. Still, a nod that it hasn't abandoned the series in the west would have been nice. Where the heck is The Last Guardian? This isn't Half-Life 3 or Fallout 4. Those games haven't been officially announced, there are no images for them, there are no trailers and company execs barely mention them. The Last Guardian, though? This thing is real. From the same studio that brought the world ICO and Shadow of the Colossus, The Last Guardian was officially revealed at E3 of 2009. It was supposed to release for the PlayStation 3 in 2011. That year came and went, no game. No updates. No trailers. No screenshots. Nothing. That's been the story at every major gaming convention since its announcement. It didn't show up this year, either. Fumito Ueda, the game's Director, has since left his studio, though he remains on the project on a contract basis. Both Ueda and Sony have said multiple times, once as recently as last week, that they are still working on the game. It's coming. It's in development. We will play it one day. Or, so the story goes. Another E3 goes by, another Sony presentation lacking The Last Guardian. I believe that it's still being worked on, genuinely. At this point, though, this single title is becoming the single biggest case of vaporware currently running the industry. That's a crying shame, because it looked good… five years ago.